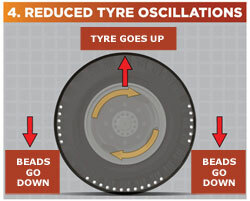 Dyna Beads dynamically balance tyres on the move, resulting in less vibration and a smoother ride that lasts the life of the tyre. Easy to install, Dyna Beads are tiny ceramic spheres, high in density and perfectly smooth, traveling inside the tyre to locate themselves opposite heavy points to eliminate out-of-balance motion. When the tyre is at rest, all the beads are on the bottom. 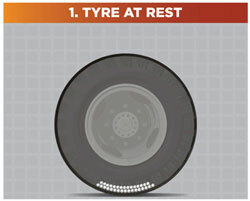 As the tyre begins to roll, the beads distribute equally around the inner circumference of the tyre. 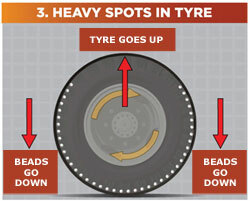 Every time the heavy spot in the tyre goes up slightly and quickly, the beads resist this motion and get forced downwards. As the oscillations get smaller the beads move more sowly to a point of final precise counterbalance. The tyre is vibration free & beads stay in their position due to centripetal force. Beads not required for counter balance are distributed equally on either side. All this happens within a few seconds with no transitional vibration. Question: Can I use your product with my Cats Eye Pressure Equalizing system? Absolutely! The factory verifies that the Cats Eye System uses the original valve cores, but simply keeps them depressed in normal use. So all you need to do is swap the original valve cores with the filtered valve cores, and you're in business. Question: Can I use your product with my Automatic Tyre Inflation system? As long as your inflation system connects to a valve stem, and the valve stem still has the original 1-1/4" valve core inside, you won't have a problem. You will have to replace the original valve core with the filtered valve core we supply.